There’s a well-worn, well-thumbed playbook to opening a restaurant in London serving a previously unknown, or at least little known, cuisine. Choose a name that sounds suitably ‘exotic’, yet isn’t too hard to spell and is preferably based on one of your chosen cuisine’s landmark dish. Preferably the very same dish you’ll be specialising in. Open a street food stall to hone your craft with a handful of dishes, while building up a name for yourself. Follow that with a residency in a friendly pub, winebar or other space to battle-test a slightly wider menu, while searching for a permanent address and pitching yourself to banks and investors. 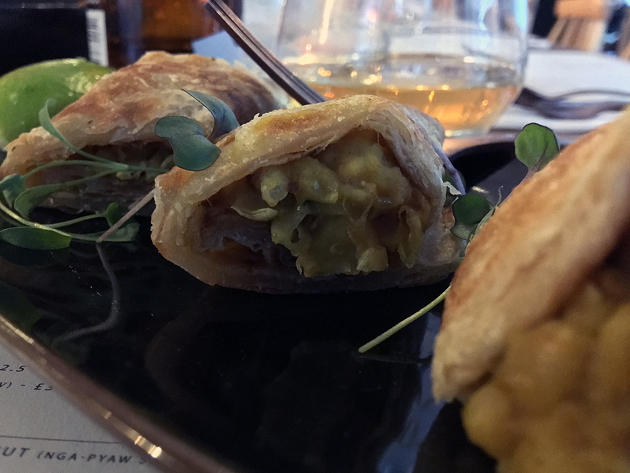 Repeat the street food and residency stages more often than you would like while customers, the media and sources of finance wrap their minds around a foreign cuisine that isn’t Chinese, Indian or one of the other high street mainstays. Finally open a restaurant in Shoreditch, Peckham or some other fashionable but affordable-ish part of town. Launch with a menu based on what ingredients you can get from the old country, but what is also novel and exciting yet unthreatening. And then try to elicit favourable publicity from the unwashed hordes of camera-toting wordjugglers such as myself. That’s oversimplifying things greatly, but that’s about it in a nutshell. 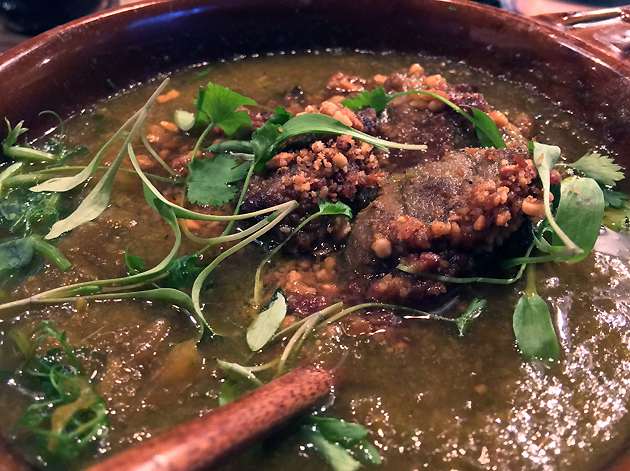 It’d be surprising indeed if the proprietors of Lahpet – one of London’s very few Burmese restaurants – had a substantially different experience. Although Mandalay, previously of Edgware Road and since relocated farther out, predates Lahpet by several years, that operation was of a different era. Mandalay’s ramshackle premises and bloated, unfocussed menu did surprisingly little to bring Burmese food to the mouths of most Londoners despite operating for years. Lahpet’s lengthy journey from street food stall to restaurant not only means that it has an attractively airy and polished premises. It has an intriguing menu that, quite fittingly, isn’t like any other you’ll find in this city. 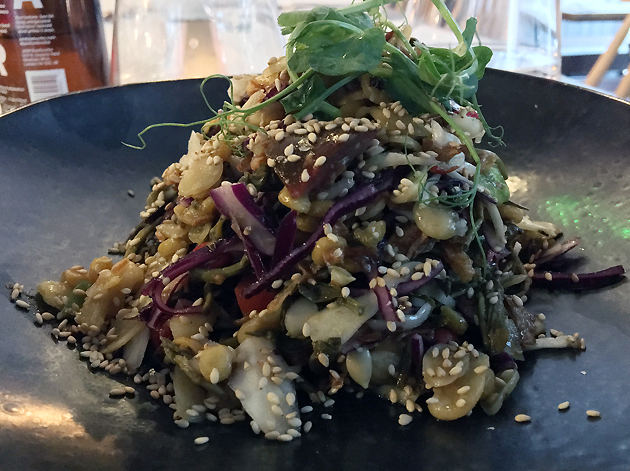 Lahpet’s eponymous signature dish is a salad of fermented tea leaves. Londoners with a long memory will remember the social media furore over a recipe for lahpet in the Evening Standard that was so ham-fisted, it managed to raise issues of racism, white privilege and ethnic representation in London’s media industries, middle/upper class fetishisation of the exotic ‘other’ and cultural appropriation – all without even trying. Given this twitch-inducing recent history, I’ll be choosing my words even more carefully than usual. While pleasingly crunchy, sour, bitter and gently tangy at first, the huge portion meant that even this melange of flavours became one-dimensional and uninteresting, with the crunchiness proving to be tiresome on the jaw. In short, I wasn’t a fan. At least, not at this portion size. Leaf it out, son, I’ve had a long day. Short but thick curls of rolled paratha, on the other hand, were joyful from the first mouthful to the last. The crisp then fluffy golden bread was the perfect conveyor for a pounded paste of effortlessly light yet moreishly nutty split peas. Although billed as a main, the stuffed aubergine proved to be surprisingly meagre in size, although this was something of a blessing following the elephantine serving of laphet. Although there wasn’t much of the smoky fleshy bits of eggplant left, the stuffing of salty, funky fermented prawn relish made up for its absence in flavour if not in bulk. Smoky aubergine and funky shrimp paste is definitely a combination that needs to be fleshed out further. This dish alone won’t leave you stuffed. 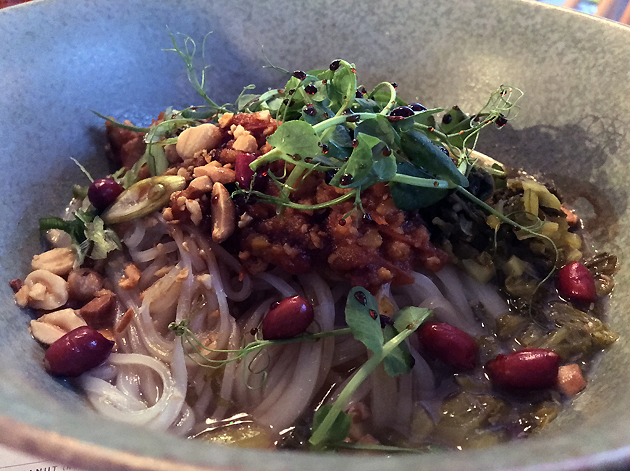 A side dish of thin and milky rice noodles came in a broth that powered along with a light sourness before ending with a surprisingly clean and crisp aftertaste. Crunchy, nutty and acidic toppings, including lightly sour and umami minced meat, were well-chosen. There’s only one dessert on the menu and it’s an odd one. A semolina cake managed to pair the familiar flavour of banana with an odd tang and graininess that definitely won’t suit everyone. It came with a reasonably smooth scoop of ice cream and a shrug-inducing chocolate sauce. 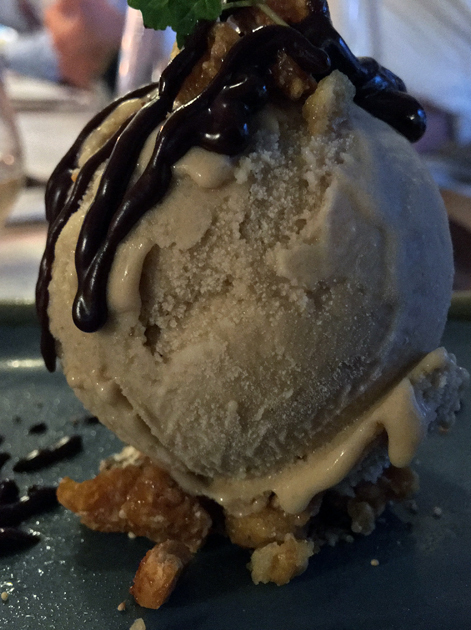 Powerfully crunchy and boldly caramelised nuts were best taken with the the cake, as they proved to be quite distracting when taken with the ice cream and almost nullified its refreshing, palate-cleansing qualities. An oddly unbalanced effort. Hardly a seminal moment in the history of cake. The thick rice noodle salad wasn’t what I expected at all. 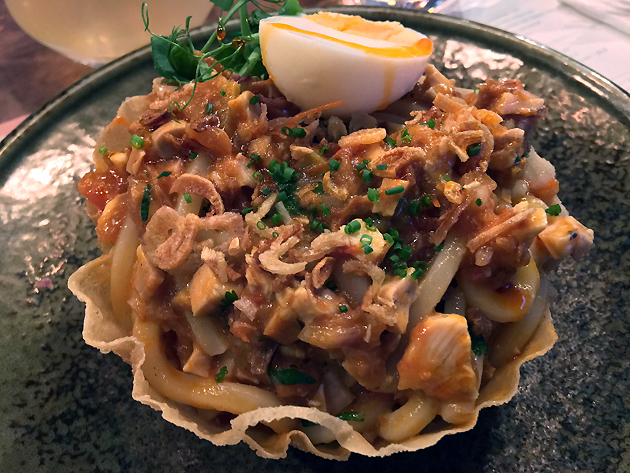 Chunky yet soft udon-style noodles came in a pastry bowl, topped with a citrusy, umami mix of minced meat and tofu. Light, yet satisfying and titillating. Everything a starter should be. Prawn relish dumplings were, from my perspective at least, similar in mashing up familiar ingredients in an unexpected fashion with lip-smacking results. 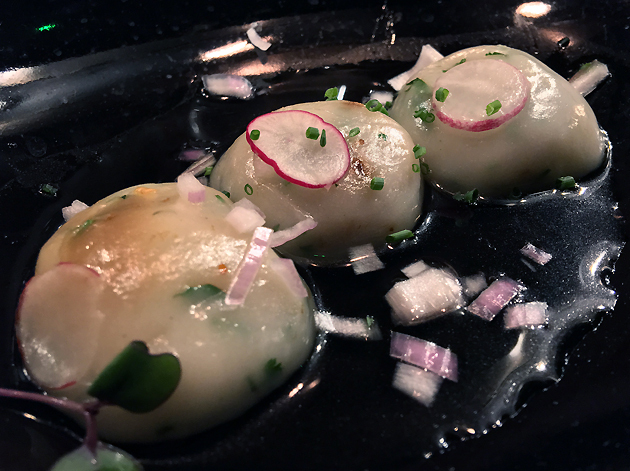 Elastic mochi-style skins cradled the funkily moreish and tangy prawn relish into my mouth. I can’t get enough of them. Where have you been all my life? Well, Burma presumably. Pork curry is one of the few meat dishes on the menu and deserves top billing alongside the lahpet. Not just because it’s a meat dish, although the pork chunks themselves were exquisite ranging from earthy yet light to quiveringly unctuous. It would only have been half a dish without the sauce. Thin yet bursting with pepperiness and citrus-like acidity, as well as mustardy, gingerish flavours, every spoonful was a multi-layered delight. A small bowl of fish soup sounds like an odd way to finish a meal, but not when it’s a moreish, lightly sour and tangy broth dotted with meaty flakes. 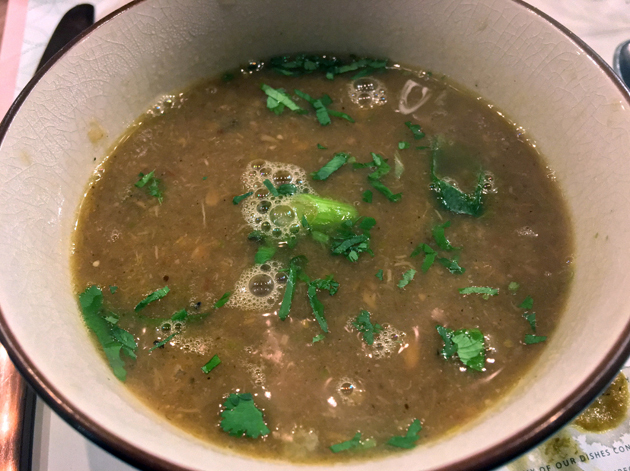 Although the pork curry was hardly spicy hot, a mild and soothing soup still seems like an eminently sensible choice for settling the stomach and rinsing the palate. I wasn’t sure what to expect from the Shan rice with fish. 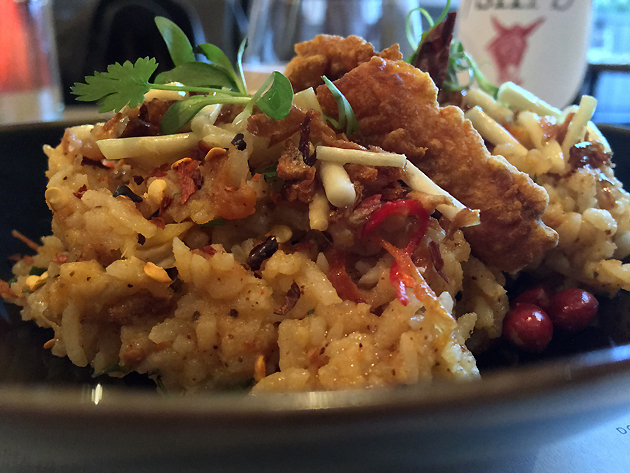 Served at room temperature, it was something like a cross between a fried rice and a sticky glutinous rice. The soft small grains clumped together easily, their moreish undertone neatly complimented by crisp and sharp garnishes. Although the two bits of fish were small, the delicately crispy yet effortlessly weightless batter was a wonder of deep-frying. I’ve been spending far too much time thinking about rice cookers. Again. King prawn curry was no by-the-numbers effort of defrosted shrimp in an identikit sauce. 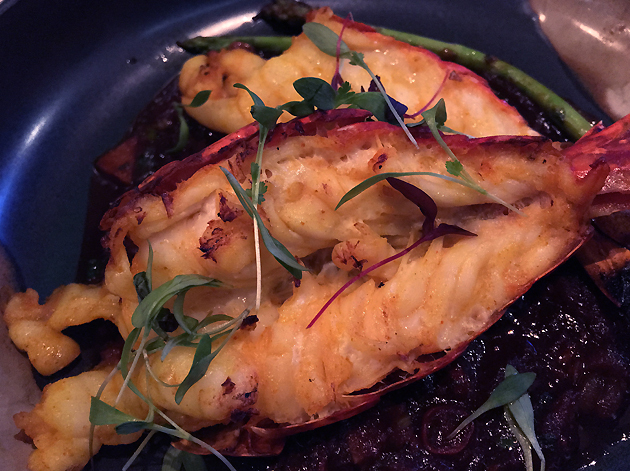 A pair of plump, firm and loomingly large crustaceans were matched by an equally superlative sauce. Treacly, tangy and reminiscent of garlic and caramelised shallots, it was mild in terms of heat, but certainly not in character. When they said king prawns, they meant it. The soft ramen-style noodles were the least impressive part of the coconut noodles with chicken. That would usually be the death knell for a noodle dish, but not here. 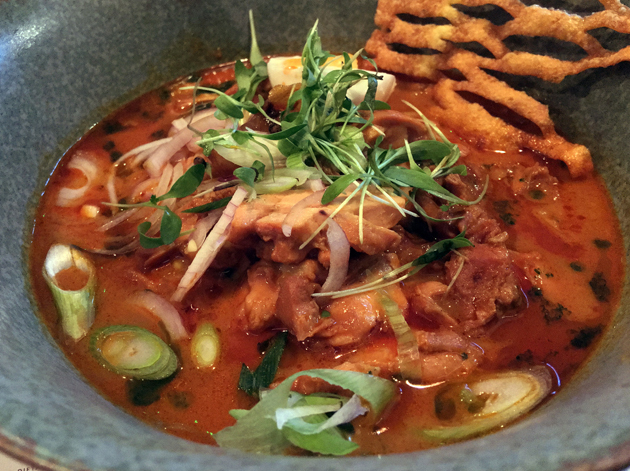 The dense, earthy rich flecks of chicken and the lightly spiced and creamy soup, similar to some styles of laksa, more than made up for the disappointingly so-so noodles. I’m using terms from other cuisines like ‘laksa’ as a point of reference, not one of evaluation. I quickly lost track of which fritter was which on the platter of assorted deep-fried morsels. 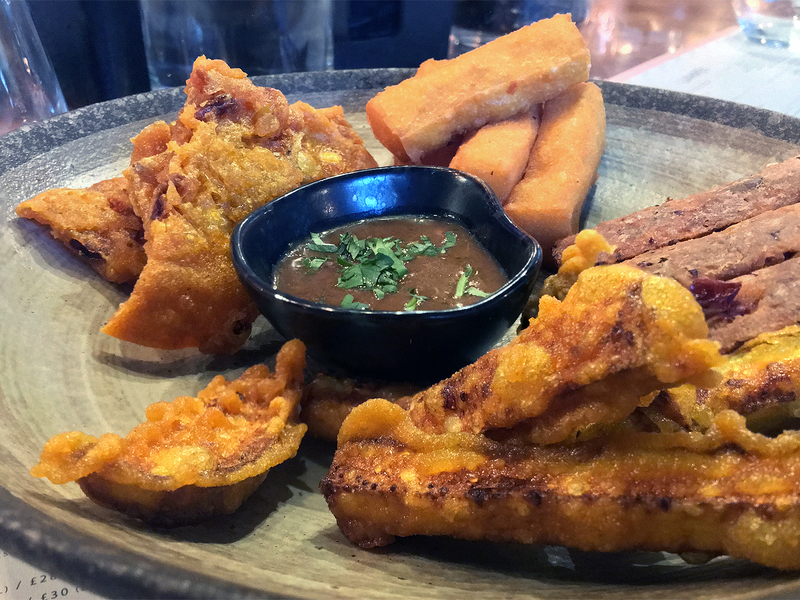 The dense, nutty and caramelish sticks – possibly the Mandalay fritters – were almost as winsome as the tofu fritters. 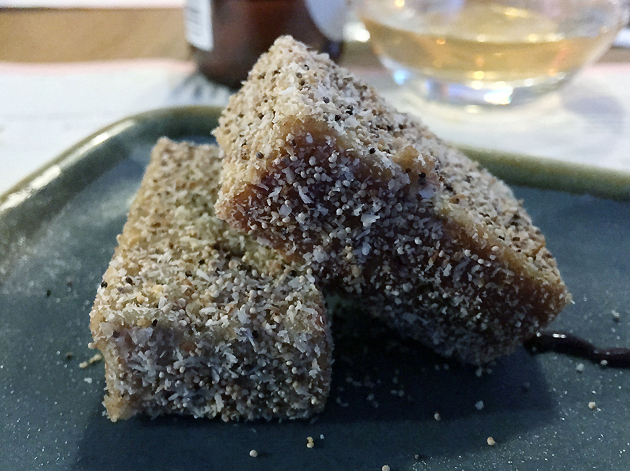 Evenly crisp on the outside, delicately soft on the inside, the tofu also had a sweet butteriness that outshone everything else on the platter. Especially the crunchy, stodgy pork crackling-like wafers which went largely uneaten. That boy’s a Hoxton Hero. 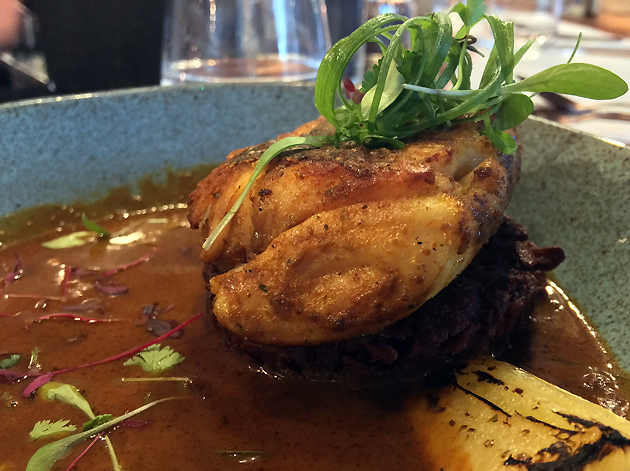 Although the hake in the fish masala was well-cooked with crispy skin and delicate flakes of pearly white flesh, it took a back seat to the sauce. Treacly dark with a tangy sourness and light bittersweetness, I scooped up every last drop. The beetroot rosti was an odd inclusion. Much the same as its more familiar potato cousin, but not as heavy, I suspect it was included as bulk to increase satiety without pushing up the price by including more fish. 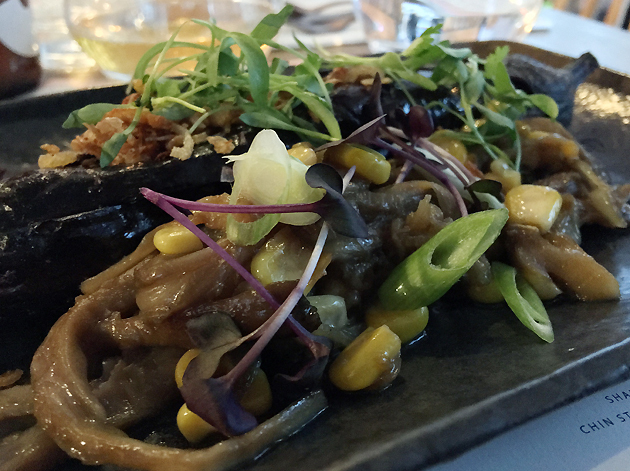 Whatever the case, this dish is still worth ordering and savouring. This review’s procrastination was brought to you, in part, by Hadouken! The tofu nway which was the only true dud across all of my meals at Lahpet. 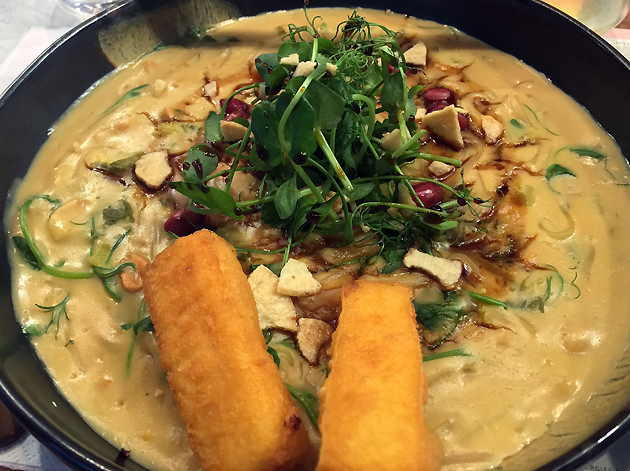 The touted tofu was merely two of the small tofu fritters from the platter, but swimming in a pool of soft ramen-style noodles and a generically creamy sauce with little to say for itself. Once the delectable tofu had been snaffled, stomaching this alternate reality mac and cheese proved tough going. Even lacing the beige gloop with a pair of otherwise superlative relishes – the punchy preserved prawn relish and a smooth yet profoundly nutty and tangy paste mashed out of preserved soya beans – wasn’t enough to make it edible. Once the relishes were devoured, I was done. I’ve now got a hankering for tempeh. 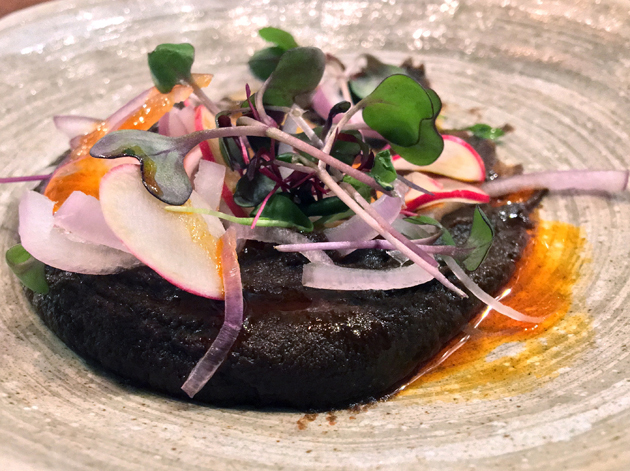 For a restaurant with plenty of opportunities to hone its craft due to its time on the street food and residency circuits, there were more missteps than I would’ve liked at Lahpet. The tofu nway, in particular, has the dubious distinction of being the dullest dish I’ve had so far this year. A lot of the flavours tended to be somewhat similar, clumping together on the tangy and sour end of the spectrum. 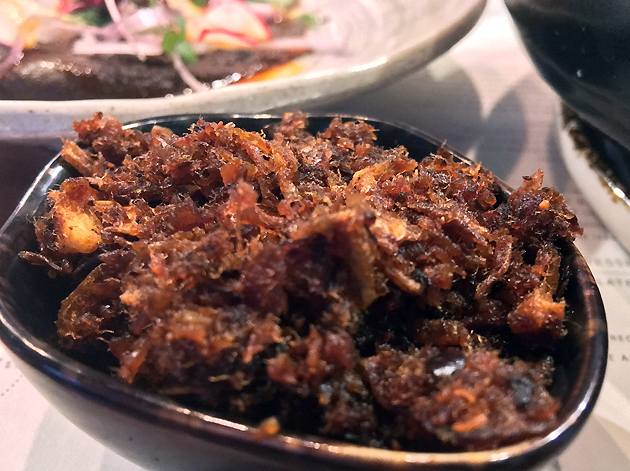 Having said all that, there are still plenty of cracking corkers at Lahpet – especially if you’re a pescatarian. I have no idea how authentic, or not, Lahpet’s version of Burmese food is. It is, for the most part, damn delicious. Lahpet isn’t the last word in Burmese food for Londoners. It is, I hope, just the beginning. Opening Hours: Tuesday-Friday noon-15.00 and 17.30-23.00. Saturday noon-23.00. Sunday noon-21.00. Reservations? Highly recommended. Fees charged for groups of six or more that no-show. Average cost for one person including soft drinks and service charge: £35 approx. £45-50 approx. if you really push the boat out. Tags: aubergine, cake, curry, deep fried, dumplings, egg plant, fish, hake, ice cream, lahpet, london, noodle soup, noodles, paratha, paste, peas, pork, prawns, relish, restaurant, review, rice, salad, soup, tea, tofu. Bookmark the permalink.